The Fair Still Runs, The Horses Don't ! I guess you have to call Lou Smith the grandaddy of Northern New England Racing, besides building Rockingham Park and Green Mountain Park, in Vermont, he was instrumental in bringing horse racing to the Rochester Fair. In 1934, Smith was one of the leaders in bringing racing to the fair, in fact it was the first half mile oval in New England to offer pari mutual wagering. At that time the fair ran for four days and looks like it ran both harness and flat racing on the card. 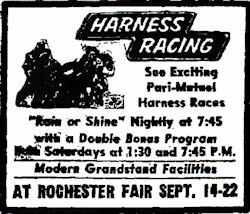 Rochester Fair at some point became strictly a harness track, over the years many top horses and drivers competed at the fair. At the end of it's run the fair conducted racing for two weeks, with it's signature Saturday double headers.